K&L Electrical carries out a wide range of weekly, monthly or annual emergency light testing facilities to ensure your premises complies with the relevant regulations. First, safe and prompt access to emergency exits (egress), and second, to provide lighting of sufficient levels, and for a sufficiently long duration, to permit safe and orderly shutdown of processes that might become hazardous if simply abandoned. Remember that failure to do so could result in prosecution in the event of an accident caused by non-compliance. Regulations on testing are covered by BS 5266, which details the requirements for emergency lighting. Those requirements state that emergency lighting systems should be periodically tested and inspected to ensure that all luminaries operate correctly in power loss situations. Who can test the emergency lighting system? Well there are a number of checks that, if you wish, you can undertake yourself. Firstly it is recommended that the daily and monthly checks can be completed by the designated person with responsibility within the building. Emergency lighting turns on automatically by a back-up battery. These are generally low voltage and are made up of several incandescent lamps. The equipment and lighting is usually positioned where light is needed most in an emergency, for example towards fire exits. They can be incorporated with emergency floor lighting as well as illuminated signs, giving real-time evacuation information. If you would like a quote on the maintenance & service of your emergency system please get in touch. 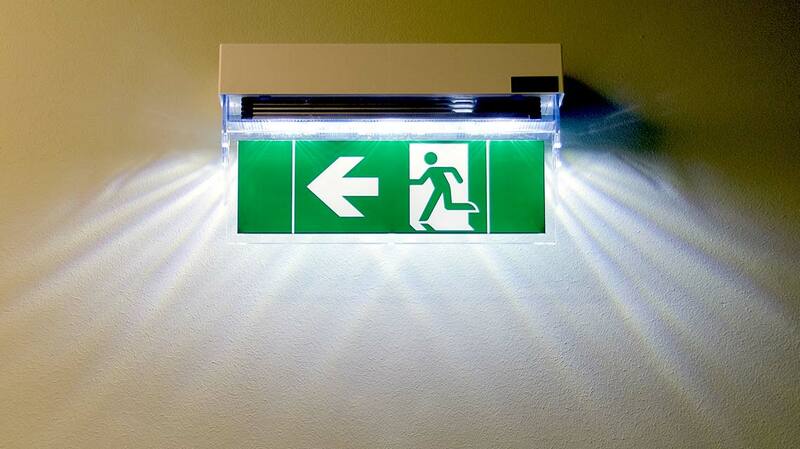 Emergency lighting is required in all premises where people are employed. It’s actually a Life Safety System and is required to assist the people in case there is an emergency. It will assist in the evacuation of a building in the event of power failure. It is a mandatory requirement to be installed where artificial lighting is installed. Keep in mind, Emergency Lighting is designed to help save lives! All Employers, Landlords or Occupiers have a responsibility under the “Fire Precaution (Workplace) Regulations 1999? to carry out a risk assessment to make sure their premises and activities have the ability to assist in safe escape in case there is an emergency. The Emergency Lighting British Standard BS5266 defines the requirements for the appropriate installation of Emergency Lighting. Compliance using this standard will make sure that your premises, complies with the requirements of the Fire Precaution (Workplace) Regulations. The daily check involves completing a visual check of the emergency light indicators and the light fitting itself i.e. are the little red LED lights on on the unit meaning power is getting to the emergency light and are the fittings suitable for their purpose and not damaged. Should either of these not be satisfactory they should be attended to immediately and be recorded in a site log. The monthly check should be for visible signs of damage to fittings and a quick operational test that is to say the light be disconnected from the power source. If the device does not light, or the lamps are dim, or if it fails to light at full brilliance for 30 seconds, the unit should be serviced, repaired, or replaced with any issues once again being recorded in a site log. The annual test requires that the power actually be interrupted to the emergency lighting unit, by unplugging it, throwing a circuit breaker, or other safe means, so no line power reaches it. The unit must provide light of normal brilliance for a full 3 hours, or it should be serviced or replaced. The recommendations are that these tests be done while the building is empty and that the building remain vacated for a further 24 hours afterwards. This is because after a “soak” test such as this it would take 24 hours for the batteries in the lights to fully recharge and should a fire or some such emergency take place in the mean time then there would not be enough power in the batteries to facilitate the full 3 hours. Who should complete the annual test and inspection? In using a specialist company with competent fully trained staff to undertake your annual check you are insuring that your installation is up to date and continues to comply with current legislation. Once we have completed the annual test and inspection we provide a full register of all emergency lights on site along with test results, a log book detailing tests completed to date and providing recording facilities and advice on monthly testing. The log book should record the date of each inspections and test, date and details of any defects, action taken and detail any changes made to the installation. As Emergency Lighting specialists, we have considerable expertise in the testing and inspection of these systems. From care homes to commercial offices and retail premises, we provide organisations of all types with an ongoing programme of testing and certification, along with remedial works if required.